What does the “trionfi” of the name of the game and the cards used to play it, refer to? That is, what definition of “triumph” informs it? Since Moakley at least, the idea that the parades and pageants of 15th century Italy inspired the subjects of the trumps, as if the cards were a passing pageant of allegorical carts, and that these carts were called “triumphs”, has been a consistent substrate to the discussion. Some of the wagons or triumphal cars reflected allegorical iconography developed to illustrate Petrarch’s Trionfi, which further conflates the two notions, or even confuses them, resulting in abortive attempts to make the Tarot trump sequence fit Petrarch’s six-triumph scheme in various ways (as it did for Moakley). Among the problems of this theoretical model, one has rarely been noted (only by me, I think), which is that the term “trionfo” is used only once in the whole of the 15th century to describe the allegorical wagons themselves. The various accounts of the parades, whether actual triumphs like Alfonso’s in Naples in 1443 or Borso’s into Modena and Reggio in 1453, or several San Giovanni processions in Florence, or the occasional Magi ones, never use “trionfo” for the staged allegory itself. The only time it is so used is in a kind of off-hand remark in a letter that Galeazzo Maria Sforza wrote to his father from Ferrara on 23 July 1457, describing an elaborate scene that without his letter we would probably never have known about (maybe it is corroborated by documents in Franceschini, I haven’t checked). For the documentation see below. I haven’t thought about it in a while, but having returned to the documents yesterday, I have a provisional theory. Briefly, the Florentine artists and merchants guilds that produced the Petrarchan cassoni and the illustrations for the earliest fully illustrated manuscripts, and also designed and produced the complex machinery for the processions (and shared the burden of producing Alfonso’s triumph), also must have conceived and designed the game of Triumphs. The conflation of the concept of “trionfo” with Petrarchan imagery and processional cars is therefore natural, although neither the game itself nor the imagery of the subjects chosen to illustrate the trumps has anything to do with Petrarch’s poem. Galeazzo Maria’s offhand remark calling the allegories “triumphs” then implies that the term was current among youths of his class who played the game as well. He recognized the genetic resemblance of subject matter in the displays before him, and simply used the term he knew best for these sorts of allegories. Alteratively, or perhaps equally, the adults he was with used the term themselves to describe what was before them. Galeazzo Maria Sforza visited Ferrara for a two month vacation in 1457, at the age of 13. He traveled by barge down the Po, from Pavia. Upon his arrival on 22 July, he noted twenty boats waiting to welcome him, and four of them had “triomphi” staged on them: (1) a rotating “mondo” with actors representing the four winds and astronomers; (2) a triumph of Love, with Cupid in a flaming chariot and couples in stately dance below; (3) a hill with a forest, with a fountain in the middle, with nymphs bathing, presided over by the goddess Diana; (4) a pageant of famous men of antiquity, on a rotating stage. As far as I can discover, this is the only time in the 15th century when the term “trionfo” is used to describe these sorts of things, for which the French term “tableaux vivants” is the most common term used in the literature on this subject in English. In her study Lebende Bilder in der italienischen Festkultur des 15. 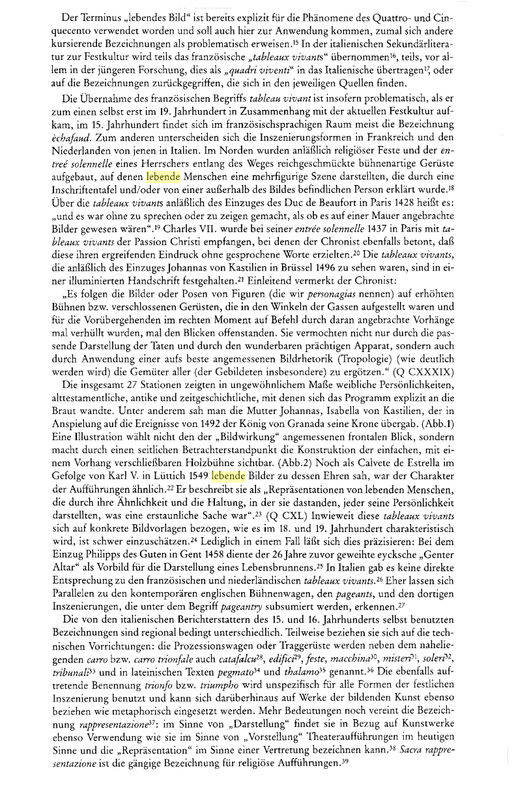 Jahrhunderts (Berlin: Akademie Verlag, 1999), Philine Helas also uses the generic term, translated into German (tableaux vivants = lebende Bilder). On pp. 3-5 of her Introduction, she discusses the variety of terms used from 15th to 17th centuries (failing to note Galeazzo Maria’s unique usage, however). 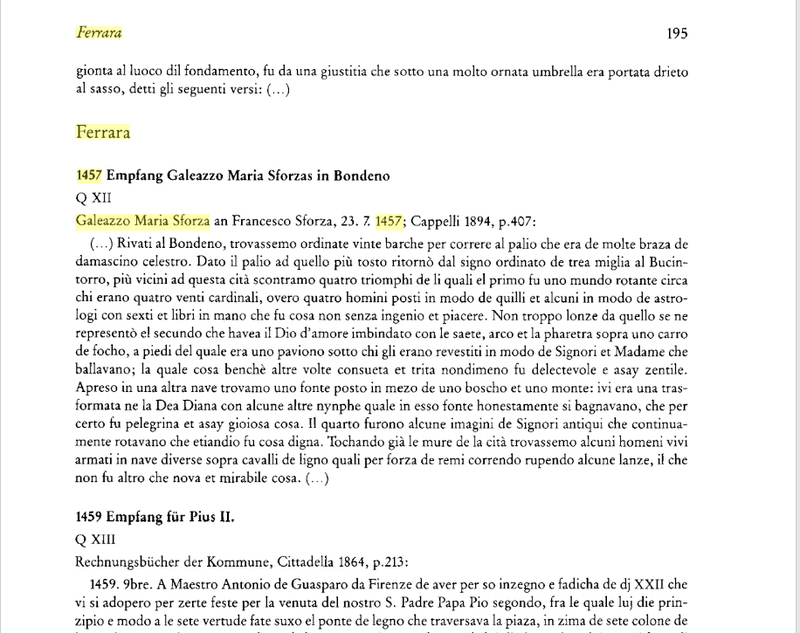 Here is a link to the Archivio Storico Lombardo XXI (1894) with Adriano Cappelli’s paper “Guiniforte Barzizza, Maestro di Galeazzo Maria Sforza”, relevant passage on pp. 407-408.
in the presented German text the author states, that "Trionfo" was used for objects on cars, but unspecifically also in various other contexts, not only in this. The used expressions were different according regional conditions ("carro trionfale etc." as in the text). I try to translate the following sentence: "The also appearing name Trionfo or triumpho was unspecifically used for all forms of the celebration shows and could also be used on works of common art and could also have metaphorical meaning." We have the pictures in Palazzo Schifanoia, one is called "Il Trionfi di Venere". Venus appears on a chariot, so we have an object on a car. Naturally I suspect only, that the name "il Trionfi di Venere" is already existing at the start of the picture (around 1469). Naturally that's not a real car, but only an object of art. "The names trionfo and triumpho, which also appear, are used unspecifically for all forms of festive staging and can also refer to works of fine art as well as metaphorically." Yes, I noted that about the "triumphs" of Alfonso and Borso, and we know it is used of various kinds of art and poetry, including the game of Triumphs. My point was about the very specific and limited use of it to describe the carts or wagons with their living allegories (Helas says "unspecifically"). Galeazzo Maria's letter is the only time it is so used. This is so we can talk about how or in what sense it is appropriate or possible to talk about each trump as a "triumph"; whether this reflects on the original conception of the game, and in what senses. I thihk it is often taken for granted that the "lebende Bilder" were called "triumphs", but we have only one piece of direct evidence for that. For example, can we assume that some of the people who witnessed Alfonso's triumph in Naples, might call the individual allegories they saw "trionfi"? Alberti in his theatre play in 1424 lets his hero "Philodoxus" speak: "I'm here at my triumphal procession ..."( 4th scene, begin of the scene). Well, he isn't at a chariot, but in a theatre play. Trionfo was rather common word, it could be transported in many contexts, for instance it even could mean playing cards. At the opportunity of Karneval there are Karnevals-Chariots in this city, for instance the Karnevalsprince has one and naturally also the local soccer club has one. And likely president Trump had also one, I would bet. I, the spectator, could call these chariots "Triumphs", as I know about the many parallels between them and the 15th century objects, but naturally I'm better understood by the local population with "Karnevals-Wagen". I would bet. I, the spectator, could call these chariots "Triumphs", as I know about the many parallels between them and the 15th century objects, but naturally I'm better understood by the local population with "Karnevals-Wagen". Well, good, you agree with my point then. At least two of us assume that some of those who viewed allegorical parade cars, or boats in Galeazzo Maria's case, would call them "trionfi". We might number among them some Florentines, particularly those involved in creating the parades that featured them.